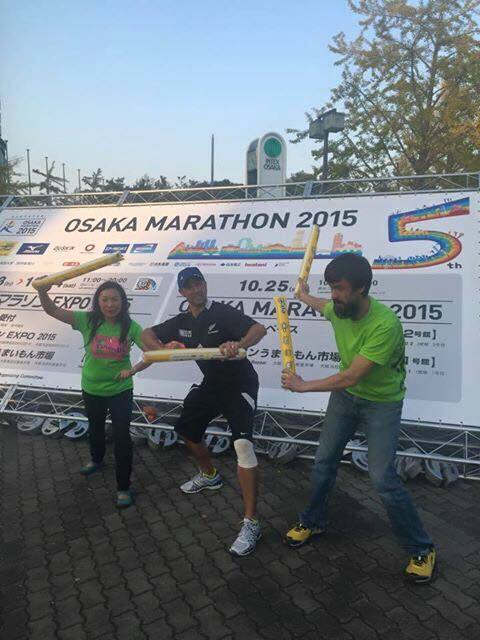 Finally recovered from the jet-lagged, and it’s time for Osaka Marathon (大阪マラソン) write-up. I needed a fall race, and preferably one that I can combine with travel. I also wanted it to be a re-birthday celebration run, so has to be a race that’s “epic“. There are many races to choose from in Oct and Nov time-frame of course, but I dreamed about how awesome it would be to travel to Japan for the fall foliage. 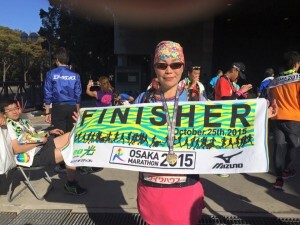 Osaka Marathon easily made it into the top of the list, and didn’t take much self-debate to go ahead and register for it. Like many big races, Osaka entry is lottery system and my running luck was working well again. I got in. This is the 5th annual Osaka Marathon, fairly new race, and entry is capped at 30,000 ppl. 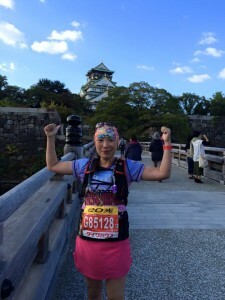 The race website didn’t have much English info, and I didn’t quite get it about making a rainbow, but the excitement of going to Osaka went on for months till I hopped on that plane!! I booked my travel arrangement in Aug, and started my training at the same time. Traveling to and in Japan is convenient and efficient, and I am low maintenance and flexible so didn’t spend too much time research or study it. Just to make sure I would stay not too far from the Start – Osaka Castle (大阪城天守閣), and somewhere close to the train station. No need for JR Pass this time since I had no plan or time to visit too many places in Japan after the race. 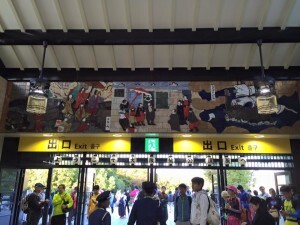 Friday 10/23, I flew into Kansai Airport; with the map displayed at the terminal I hopped on the Nankai Express train and it took me to Namba. I had some hard time finding the Yotsubahsi line (四つ橋線) subway, and was really tired after the long fly. Sweating like crazy dragging my luggage and walking up and down the stairs was definitely not much fun. But eventually found the right subway and reached Higobashi, hotel was right by the exit#3, perfect! The night was cool and very comfortable to walk around shaking out my very stiff legs. 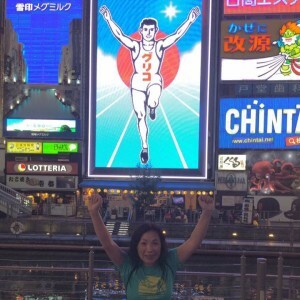 I stopped at the Glico Man sign and did the famous running pose, the most Osaka experience besides the Castle I think!! Of course stopped by the giant crab restaurant but no plan to try anything exotic before the Marathon though. 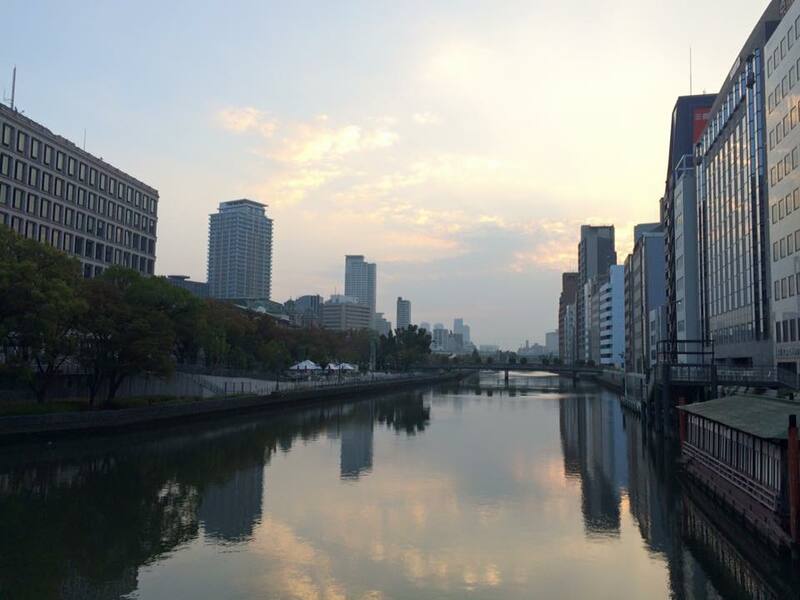 Osaka is a very modern city, and feel much more relaxed and open than Tokyo to me. Sat morning 10/24, woke up around 6:00am and headed out for my shakeout run. By looking at the Google Map, I could see rivers running through the city and I figured I could do an out and back along the river. 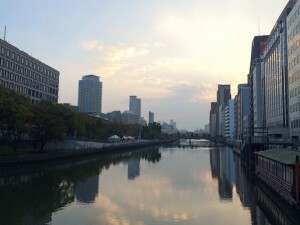 I have learned from previous trips that “bashi” means bridge, so where I am now, Higobashi, is near a bridge and I easily found the river. The air was fresh and not much traffics at 6:30am; only came across couple morning joggers and I said “Hi” or “Ohayo” but didn’t get response back, and they probably thought I was weird :-p There was a rose garden, several bridges in varies and beautiful style. At around mile 1.5, spotted a minimalist style cafe facing the river and as I got closer I was surprised to find it’s a McDonald! What a beautiful and chic McDonald. Running back to the hotel and came across two very fit and good looking runners at the stop light, and they were twins! Good looking twinsies runners!! We took the subway and I made sure I tagged along closely cus it’s a busy Sat afternoon. The Osaka Marathon Expo is at the INTEX Osaka, and later I found the whole logistics of Osaka Marathon is very similar to Tokyo Marathon. From the runners handbook, race packet, bib pick up, Expo floor, volunteers… etc, later Randy told me that the race organizer is the same. 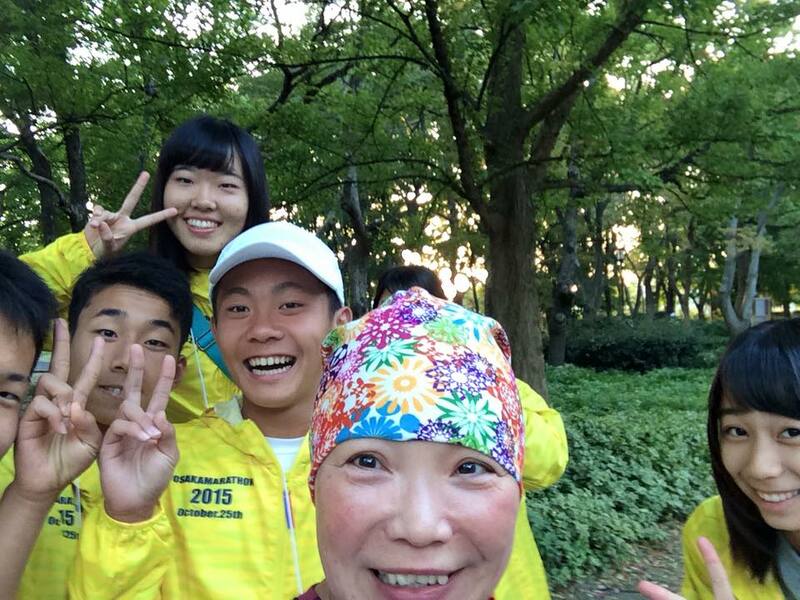 No wonder that Osaka is a fairly young race but everything seems to be so perfect. We picked up our bibs from the Foreigners side, and got our shirts and goodies bags efficiently. We started geeky out and goofing around on the Expo floor with Randy acting as the tour guide today, without that little white flag :-p This is Hamish’s first marathon, so we both benefited from having Randy with us. The night before the race I stayed in my room and was really excited about tomorrow. As part of the race ritual, I laid out my running clothing, pinned my bib number, tied the timing chip to my shoes, and packed couple GU gels with me. I have planned to carry my Salomon hydration pack, just to be safe, but I knew the course would be well managed and stocked — this is Japan!! 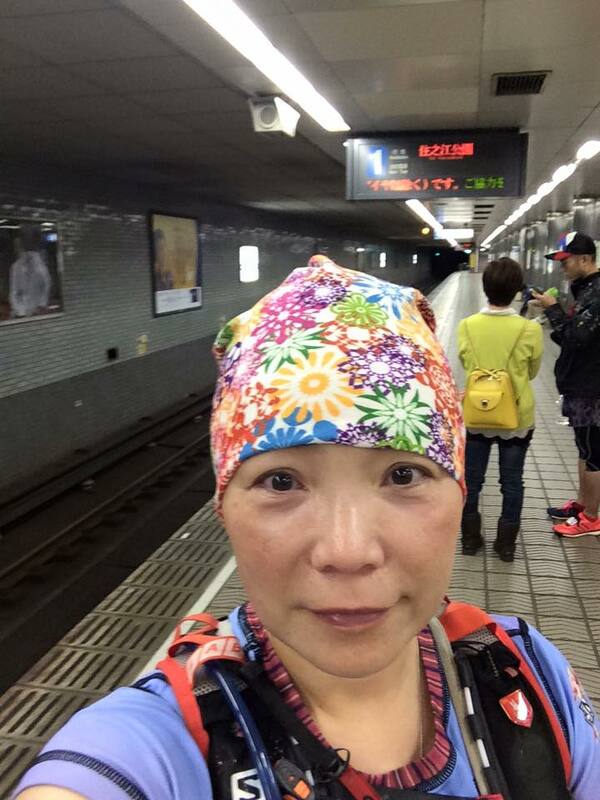 I brought a specific Buff with me for this race, a bright and beautiful floral design called Osaka. Wonderful, isn’t it? 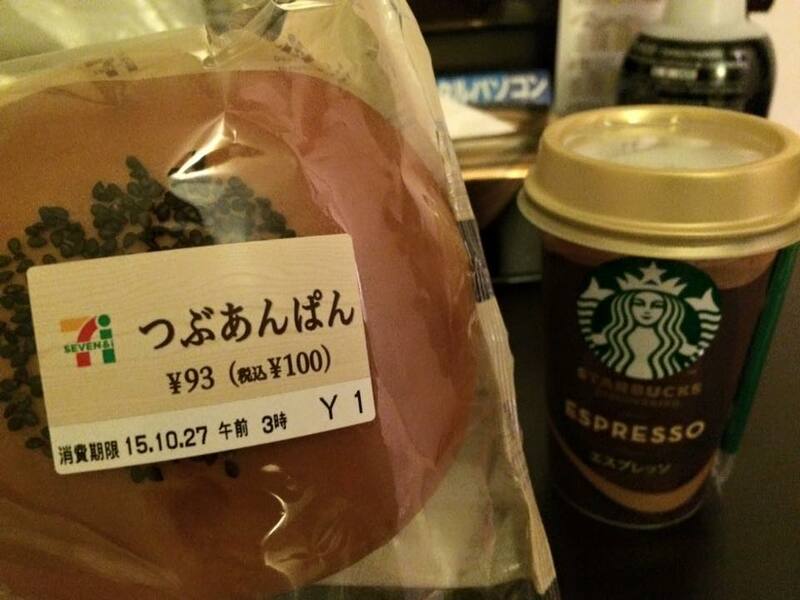 I also bought an ann-pan bread and a canned Starbucks coffee from the Family Mart, which would be my race day breakfast. Went to bed around 10:00pm and slept well. Sun 10/25, no worry about overslept 🙂 Got up before the alarm went off, drank the coffee, a quick shower to get blood circulation going, and put on my Power Suit for this race 🙂 At such early hours on Sat, there were not many passengers at the subway station except runners, and all looked tense and quiet. Got off at the Hommachi station and instead of transferring onto Chuo line, I decided to follow fellow runners and walked to the Osaka Castle Park. It’s a nice warm-up walk, and I am very glad that I did the walk because I got to see volunteers preparing for the big day in a chilly morning. Like in the US, many of the volunteers were high school kids and their smiles were contagious!!! 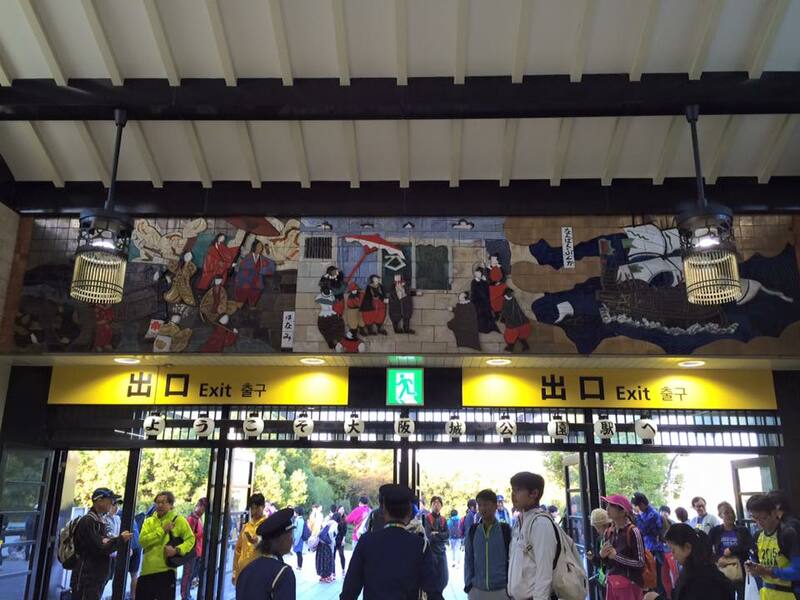 I walked to Osaka Castle JR station and was truly impressed how beautiful the station was. I stood by the entrance and waited for Randy and his friends, getting more and more excited by the minutes watching all the runners walking out! After our group got together we went to the “Foreigners” booth and checked out the course map, the volunteers were college girls and Randy explained that girls are better in English here, or more eager to practice their English skills. We posed for the newspaper pretending to be foreigners asking for help, while in fact that Randy has run this race many times that he was very resourceful to all of us already. We parted briefly to drop off our bags and to use the porta potties again. This time Randy told me “go use the pink ones, they are for girls.” Ahha!! 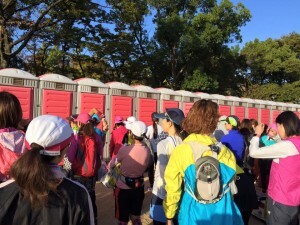 Japanese women do not feel comfortable to share the porta potties with men, and they would rather use the squat toilet rather than the sitting ones, hence the white and pink ones. After we came back from our respective porta pottie, time for group pictures and we were ready to GU For It 🙂 Why am I the only girl?! Of course, an obliged race day photo by the Castle! 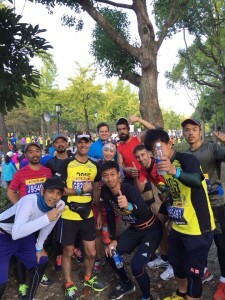 During my training I worried that the weather might be too warm this time of the year in Osaka, but it’s a bit chilly at the start and continued to be very comfortable throughout the race. After the gun went off, Steven and I said “good luck” to each other and soon I lost sight of him in the crowds. 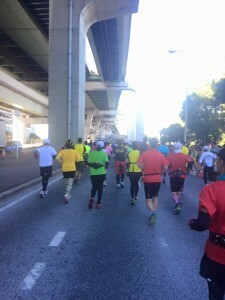 There were quite a lot of costumed runners, and it seemed to be similar to Tokyo but I could feel the difference. It’s a big race with small town feel. The course took us through famous Osaka landmark, and the crowd support were just amazing. 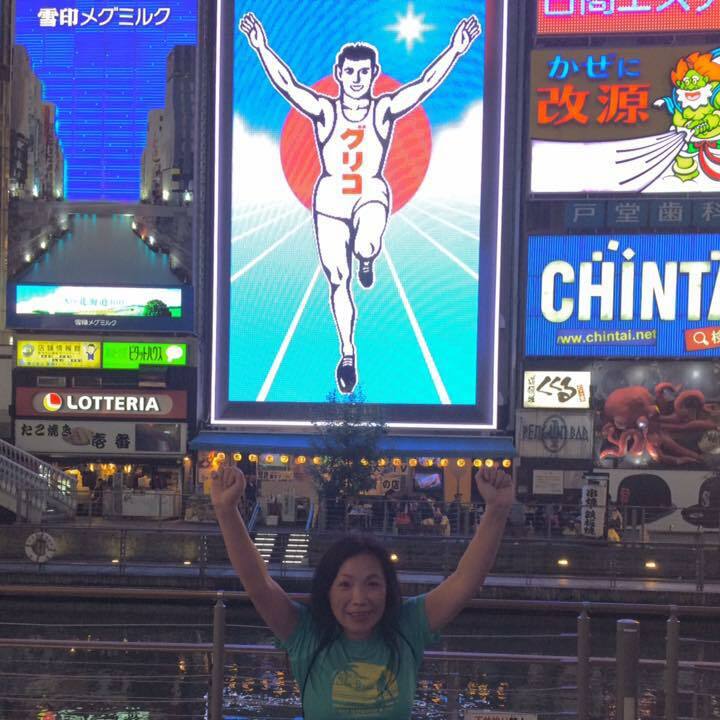 In Tokyo Marathon, local supporters shouted “Gambatte” while in Osaka they cheered runners with “Fighto Fighto”! 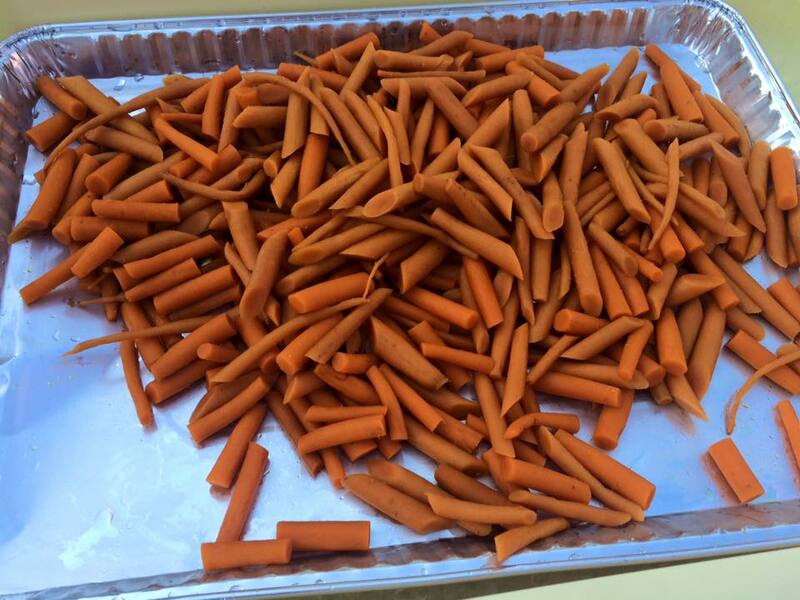 Little kids screamed from the top of their lungs and lost their voice eventually. It eventually got warmer and I started seeing runners slowing down their pace. So it’s refreshing when I smelled the familiar Salonpas in the air around Km30 and I stopped. But there was no aid-station! 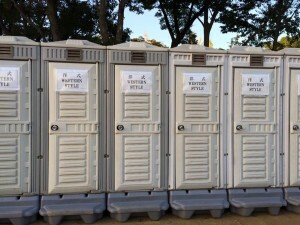 I saw a Japanese guy holding several cans and handing them out, but I wasn’t sure if he was there to support his running buddies or if he was a medical aid. I must have the puzzled look on my face, and before I realized what’s happening a Japanese runner knelt down in front of me and started spraying the heavenly Salonpas on both of my calves. OMG!! That felt so great and I bowed and said “arigato!” repeatedly. I can’t believe that just happened and it said a lot about how open and friendly Osaka people are! I continued my run with huge smile on my face! 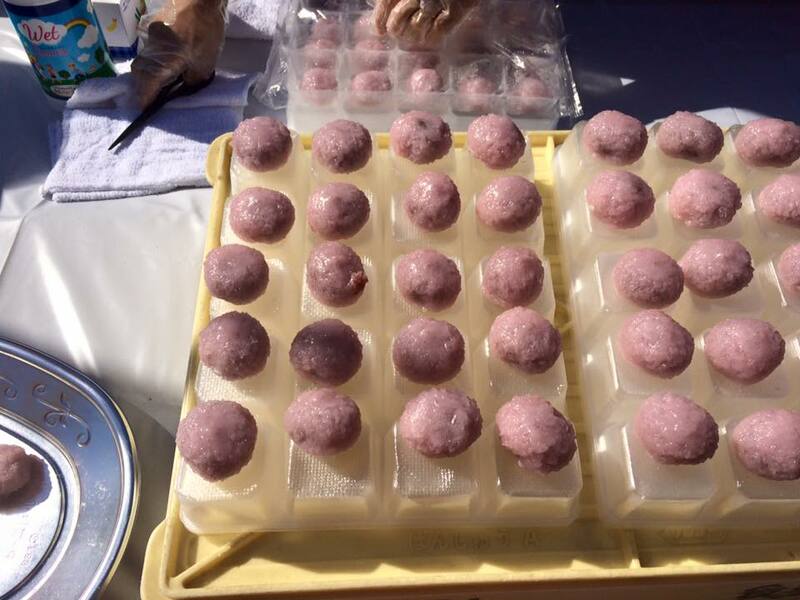 Then came to the real heaven near the Suminoekoen park, the famous Osaka Marathon maido-aid, トップ – 大阪マラソンまいどエイド－商店街給食支援隊. at Km32.5. There were about 20 aid-stations with food from local merchants. 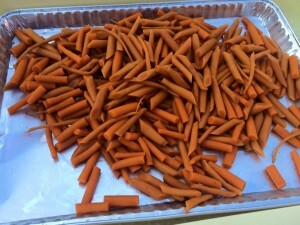 I saw an army of volunteers with tables of treats that I really struggled “do I stop and check this out? or do I continue to run?” “Wth, I am not flying thousand miles to here and miss an unique experience like this!” I started walking through every aid-station tables and taking pictures or sampling them. 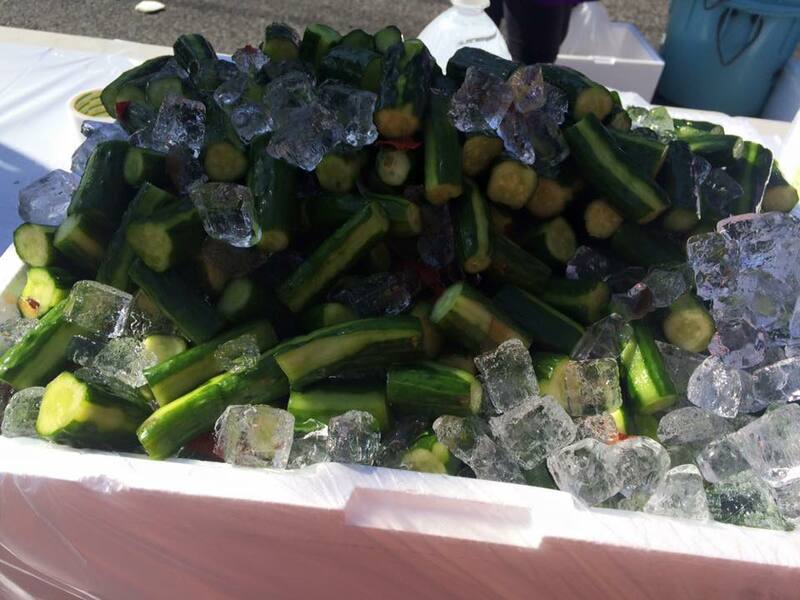 They all looked very interesting and delicious, but I at least have the willpower and common sense to avoid seafood and meat..etc, didn’t want to DNF due to stomach problem. 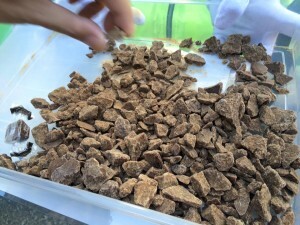 Here are few items that I fell in love with at this race. I didn’t see finish chute that we usually have in the U.S., but I remembered Randy told me that the finish would be there after making that left turn. 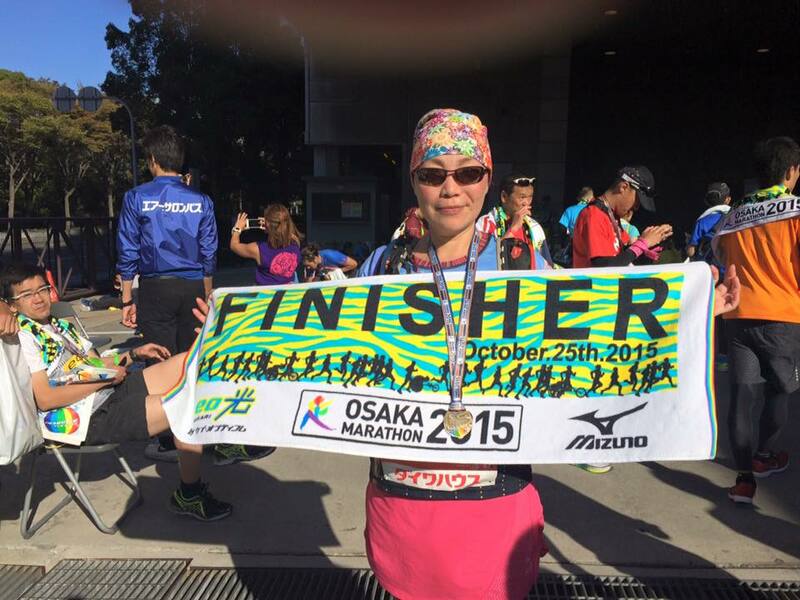 I started sprinting after that left turn and the crowds roared with “fighto fighto.” With heartfelt appreciation to all the spectators, volunteers, fellow Japanese runners, I crossed the finish line. Great to finally see this Two years Later!!!! Thanks so much for such a detailed race report! Can’t wait for you to come and run your next race with us! !